This research study explains the impact of Foreign Direct Investment (FDI) on the happiness of countries. 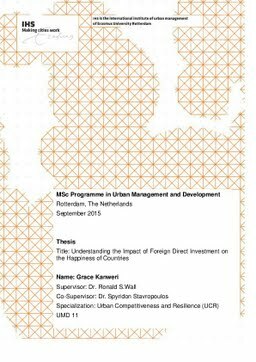 The study was aimed at explaining the direct and indirect impact of inward and outward FDI on happiness of countries and the related spatial variation of such impact across different regions of the world. This explanation was achieved through answering the main research questions; to what degree does inward and outward Foreign Direct Investment (FDI) influence Happiness of countries? And the sub research questions which included; Does FDI directly influence happiness of countries? Does inward and outward FDI influence indicators of happiness implying an indirect influence of FDI on happiness? To what degree does the indirect and direct influence on happiness vary across regions? The study used quantitative methods and secondary data to accomplish to obtain answers the research questions. It involved construction of six years panel data on happiness; the dependent (Y) variable, and independent (X) variables of inward and outward FDI as well on other variables that were controlled for, namely; unemployment, carbon emissions, electric power consumption per capita, control of corruption, percentage of total population living in urban areas, percentage of total population with access to protected source, country and population size. The study sample included 78 selected countries. Excel program was used to prepare the database, while regression analysis using random effects model was used to analyse the data, establish the statistical and descriptive findings of the study. Thesis Advisor Wall, R.S., Stavropoulos, S.